BlackBerry Curve 8900 officially launched on T-Mobile | BlackBerry Blast! It's official. 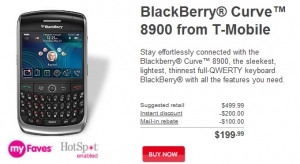 T-Mobile has launched the BlackBerry Curve 8900 in the U.S. The price under a new 2 year contract is $299 with a $100 mail in rebate. You can purchase the phone outright without contract for $499. BlackBerryNews reports that shipments have been limited to 5 per location so you'd better pick yours up quick. Additional shipments should be arriving later this week.